From Prima, for those who want the best! These are the nicest stainless steel expansion chambers we've seen! Thick material, exceptional build quality, perfect welds, and shiny polishing make this the pipe to have! With the same performance as a Scorpion, JL, or PM Tuning, but a MUCH lower price tag, this is the best deal around. Fits 200cc P Series. You'll have to relocate your spare tire to mount it. A rear rack like the RRC5 will work nicely to hold your spare. Will fit Rally 200 or other early models with a 200cc engine, but the pipe interferes with the centerstand, so you'll have to use a sidestand instead. Don't forget you'll need to rejet your carb! Looking for more performance upgrades? 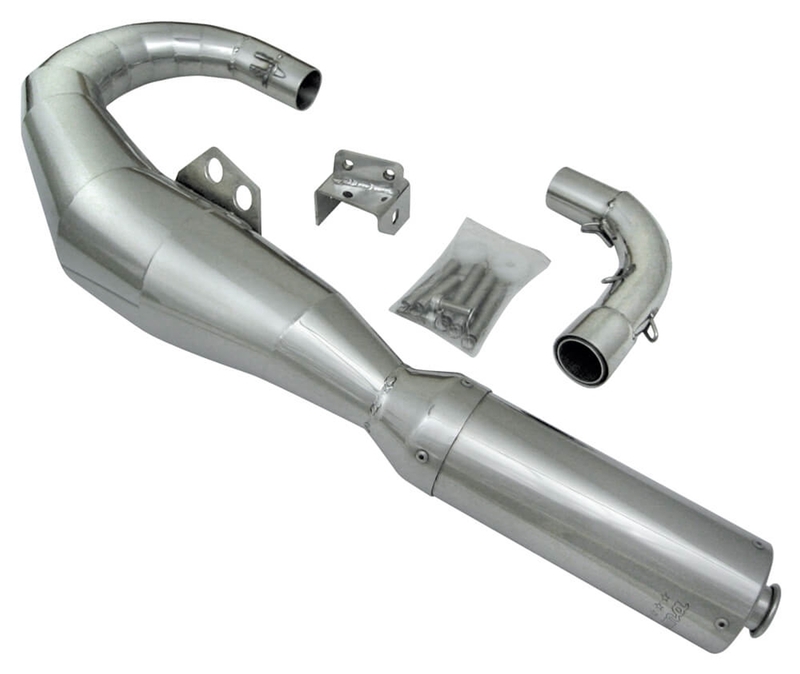 We also carry a P200/Rally performance kit that includes this pipe! Mounting instructions can be downloaded here.